What is EMG Live Chat? EMG Live Chat is a powerful, secure and innovative Online Chat tool that lets you provide immediate service for your clients and visitors from within your website, and also allows you to see in real time what your visitors are doing on your website. 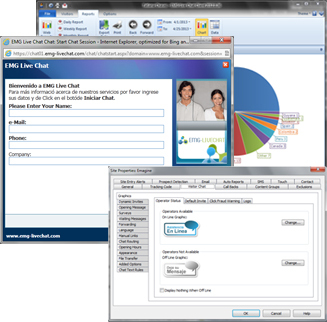 EMG Live Chat has a robust and advanced processing system that is capable of managing high chat-traffic levels, as well as connections with hundreds of operators, in order to provide a service that is always available and efficient, and that allows you to provide support to the greatest number of clients and visitors possible. The system has a wide range of tools to manage and assign chants, as well as automatic chat routing; wait line management; service hours; auto-responders; dynamic invitations; and many other features. EMG Live Chat is under constant development, always incorporating new functions, searching for new ways to do things, and working to improve efficiency. We are committed to our clients. That's why we always offer technical support when you need it most – 24 hours a day, 7 days a week. If you're going to offer Chat service on your website, it's important that your system be always available to interact with users. EMG Live Chat guarantees service uptime of up to 99.75% of the calendar year. Provide customer service via EMG Live Chat both on your own website and from your Facebook profile.